Yesterday I was fortunate enough to come home and find an extremely generous gift from my good friend Peter, sitting on my doorstep. (…which I very much appreciated, because the day was extremely crappy, to say the least). 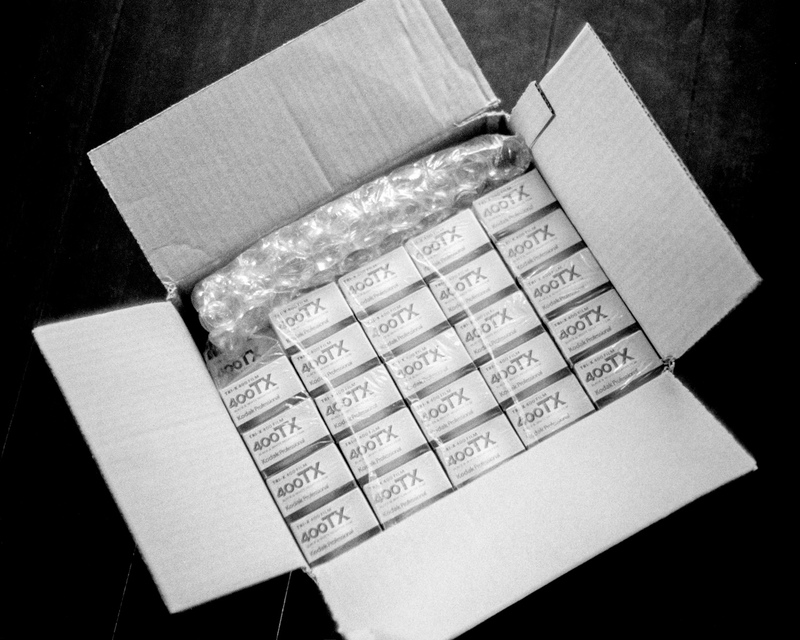 50 beautiful rolls of Tri-X 400. In any case, I did what any self-respecting photographer would do, and promptly ripped it open. The shot above is the first shot, on the first roll, on the first day…um…of the rest of my life. And thus, in a somewhat muffled ‘click…’ the “50-Roll Project” was born. Over the next (I don’t know how long…hopefully before they all expire!) I am going to shoot, develop, and post a sampling of photos from every single roll. It may be two, or three, or five (it will actually be however many I darn-well please…) but there will be something from each and every roll. Hopefully weekly. Or so. I am hoping to inspire others to take the plunge, and keep the art alive. I wouldn’t have done it without Peter’s inspiration. I hope you enjoy…now go enter Peter’s contest and win the other 50 rolls!! Glad you got the film Mark. I’m so excited for you, and I think your 100 roll project is a fantastic idea! 1. I thought I only sent you 50 rolls?! 2. In all fairness, I had warned you that one pack had expired a week ago (I needed to keep lots of perfectly good film for my contest – for some important stranger who will be declared the winner). Note by Management: Comment slightly truncated for reasons of national security. No no…there were 100 there!! …Heh heh. Whoops. I am a doofus. I cannot count…I was simply too excited. Edits made to reflect my ignorance–and I certainly wasn’t complaining about the film–it was barely expired! And thanks for truncating my comment for the sake of national security. Yeah, I may have to buy 50 more rolls now! …Anyway, I didn’t want a “Diplomatic Crisis” between our websites. Good luck Mark!! Thats a lot of film! Thanks Andy…It certainly is. Hopefully you can still buy developer by then!